BRLPS Notification is out. BRLPS is recruiting for 247 Various Post Govt Job Posts. 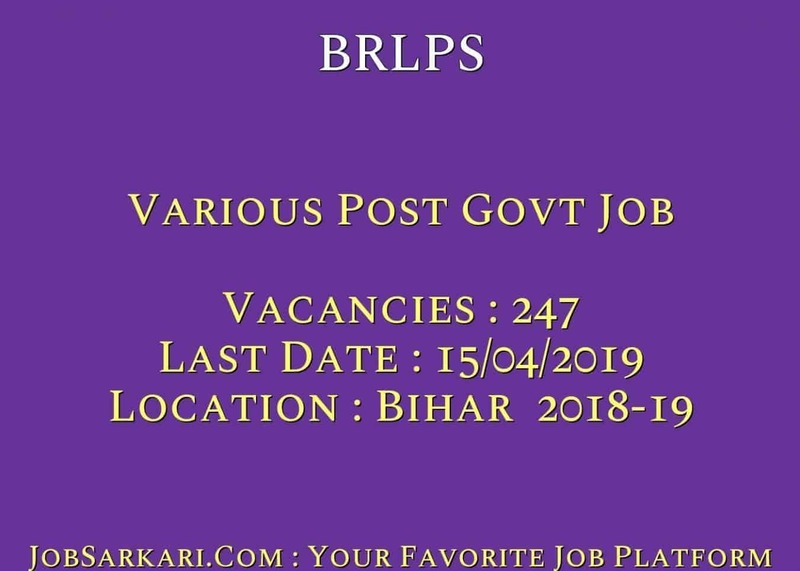 You can check BRLPS - Bihar Rural Livelihoods Promotion Society - JEEVIKA last date, download BRLPS notification, visit BRLPS official website and check other BRLPS Vacancy details.Complete Vacancy and recruitment Details about 247 Various Post Govt Job vacancies in BRLPS are provided below by JobSarkari.Com only for you. State Consultant- MLE & MIS. Candidate Must Have Passed Graduation in Engineering With a Specialisation in Computer Science or IT. Having Post Graduate in Social work/ MBA/ Rural Management/ Rural Development/ Public Policy/ Statistics or Actuarial sciences And Having 5 Years Experience in Related Field. 01. 00. 00. 00. 00. 00. 00. 01. Accountant. Candidate Must Have Passed Post Graduation in Commerce And Having 2 Years Post Qualification Experience in Related Field. Having Graduate in Commerce With 3 Years Post Qualification in Related Field as Mentioned in Notification. 01. 00. 00. 00. 00. 00. 00. 01. Project Manager (ODF-S Cell). Candidate Must Have Passed Post Graduation in Management And Having 7 Years Post Qualification in Related Field. 01. 00. 00. 00. 00. 00. 00. 01. Consultant- SLWM (ODF-S Cell). Candidate Must Have Passed Post Graduation/ Graduation in Management With Experience in SLWM Engineering/ Urban Rural Planning/ Environment Discipline With 5 Years Post Qualification in Related Field. 01. 00. 00. 00. 00. 00. 00. 01. Consultant-IEC/CB (ODF-S Cell). Candidate Must Have Passed Graduation in Communication/ Journalism With Experience in Related Field And Having 5 Years Post Qualification Experience in Related Field. 01. 00. 00. 00. 00. 00. 00. 01. Consultant-Technical Sanitation (ODF-S Cell). Candidate Must Have Passed Graduation in Environmental or Civil Engineering With Experience in Related Field And Having 5 Years Post Qualification Experience in Related Field. 01. 00. 00. 00. 00. 00. 00. 01. District Coordinator. Candidate Must Have Passed Graduation With Preference to Post Graduation/ MBA And Having 5 Years Post Qualification Experience in Related Field As Mentioned in Notification. 00. 01. 01. 00. 01. 03. 00. 06. District Consultant- CB & IEC. Candidate Must Have Passed Post Graduation Degree in HR Management/ Business Administration/ Rural Management/ Social Work/ Rural Development or Public Health With 3 Years Post Qualification Experience in Related Field. 06. 02. 02. 06. 01. 04. 00. 21. District Consultant-MLE & MIS. Candidate Must Have Passed Graduation in Engineering With Specialisation in Computer Science or IT or a Graduate in Statistics, Actuarial Sciences With 5 Years Post Qualification Experience in Related Field. 05. 03. 05. 07. 01. 06. 00. 27. District Consultant-SLWM. Candidate Must Have Passed Post Graduate Degree in Environmental Science, Rural Development, Social Work, or Graduate Degree in Environmental Engineering, Civil Engineering or Agriculture And Having 5 Years Post Qualification in Related Field. 10. 03. 05. 07. 01. 06. 00. 32. Block Coordinator. Candidate Must Have Passed Post Graduation Degree/ Diploma in Rural Management/ Development/ MSW With 2 Years Post Qualification Experience in Related Field. Having Graduation With 3 Years Post Qualification Experience in Related Field as Mentioned in Notification. 104. 15. 00. 00. 16. 15. 05. 155. Total Vacancy. 131. 24. 13. 20. 20. 34. 05. 247. 3. Candidate Need to Fill All the Details in Application Form And Need to Upload Scanned Copy of All Mandatory Documents As Mentioned in Notification. 4. Candidate Need to Apply Online on or Before 15th April 2019. Q. What is the Last Date For BRLPS Various Post Govt Job Vacancy ? A. 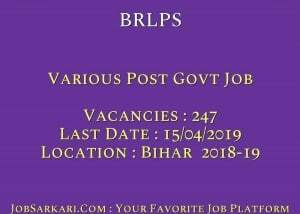 Last Date for BRLPS Various Post Govt Job Posts is 15/04/2019. Q. What is the Form Type of BRLPS Various Post Govt Job Recruitment ? A. The Form Type for BRLPS Various Post Govt Job Posts is Online. Q. How many vacancies are available in Bihar Rural Livelihoods Promotion Society - JEEVIKA Various Post Govt Job Posts ? A. There are about 200 Vacancies in Bihar Rural Livelihoods Promotion Society - JEEVIKA Various Post Govt Job Posts. Q. What is the Full Form of BRLPS ? A. Full Form of BRLPS is Bihar Rural Livelihoods Promotion Society - JEEVIKA .